It is tough being an amateur endurance athlete. Every time you thought that you had nailed it and your act was in place – out pops a new term / technique / concept to confuse the whole issue ! 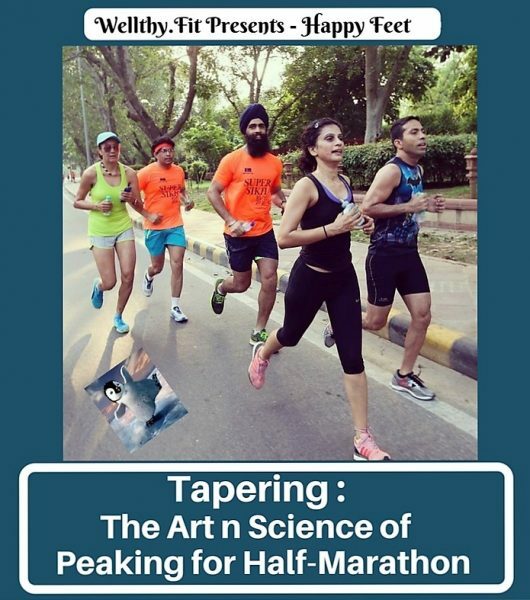 The latest – Taper : reduction in training load just prior to the race day. Sounds rather counter-intuitive with most of having been brought up on the concept of progressively increasing hard work peaking on exam day ! Popular running literature recommends reduction in training load 8-14 days prior to race day to let your body recover and adapt from weeks of hard training and deliver your best. Done right – it promises upto 3% increase in your personal best (Heads Up ! That is a five to eight minute improvement in half marathon timing for most amateur runners !). Wish it was so SIMBLE – it is more mental than physical. Time to understand this genie and make it work for you. Purpose – sharp, rested and zippy legs on race day. How – reduce training load to reduce the accumulated fatigue of hard training and rebuild glycogen, enzyme, anti-oxidant, hormones levels and improved circulatory system (blood volume and red blood cell count) for peak performance. Remember – the impact of any training is felt only 8-10 days later, so any last minute sprints or long runs are not going to help you on the big day ! The duration of the taper actually depends upon the physical adaptation and recovery profile of each athlete. Could vary from as much as one week to four weeks. Since most of us are amateurs with routines driven by our job and family commitments; we recommend commencing your taper 8-14 days prior to the big one post your last long slow distance run. Low Mileage, High Intensity. Commences post your most intense training session of the training plan about 10-14 days out. Maintain same frequency of number of runs per week. Reduce daily mileage to 50-60% progressively. High training intensity. Run at race pace or faster. Short recovery runs on alternate days for last four days. Overall focus – fast running with recovery as top priority. Possible cons – probability of injury, increased lethargy due to large reduction in mileage and mental anxiety of not doing enough. Medium Mileage, Variable Intensity. Start 8-10 days prior to race day. Frequency of runs per week as per your ongoing training plan. Reduce mileage for the first week to 70-80%. Further reduce to 50-60% during the race week. Running intensity centred mainly around race pace and threshold runs with one odd slow run for recovery. Last three days for rest and recovery runs. Possible cons – may end up doing more due to the stress of last josh type mental make up of most amateur athletes ! Hence overall body recovery may not be ideal. Medium-High Mileage, Medium-High Intensity. Basically implies little change in your training program with some rest to promote recovery. Rests on the concept that our bodies don’t like abrupt change. More suited to elites and hardened athletes whose bodies have mastered the art of quick recovery ! Our Recommendation. Go for a mix of the first two types. Listen to your body as you go through with the taper and adjust accordingly. Tame the monkey mind. We are simply not conditioned to reduce our preparation intensity prior to the big day. The reduction in training may make us lethargic and heavy. Don’t worry; it is a natural process of body recovery. Remember – taper does not imply reduced number of runs. It is reduction in distance done at the right intensity or pace. Remain injury free – avoid hard intervals, sprints or hill training. As it is the gains from these will not be felt till at least 10 days after ! Remain supple and flexible – continue with light stretching routines. Warm up and moderation are the key. Again, we don’t want any injuries or soreness due to overdoing the stretching bit. Stop or reduce strength training – linked to remaining injury free, delayed gains and maintaining suppleness. Don’t put on weight ! With reduced training intensity and focus on carb-loading we may end up putting on weight. Fun fact – a reduction of 1 kg weight translates into reduction of full marathon time by upto for minutes and vice-versa ! DON’T reduce at the last moment – MAINTAIN ! Enjoy this new, complex and vexing dimension of endurance training ! Conquer it to get your personal best ! Makes the taste of victory even more sweeter.